Click on category names in the list provided to view our building process. We gain a thorough understanding of your current and future family size, lifestyle and housing needs, and budgetary parameters. We discuss how you want to live in your home and what’s important to you. You’ll have access to our large portfolio of designs, or we can work with a plan designer to create your own custom plan. We can also help you find the ideal homesite in one of our neighborhoods or another area you may be considering. Based upon the criteria and priorities set forth during our vision meeting, we will be able to provide a preliminary budget. If you choose to create a one-of-a-kind custom home, we will work with you and one of our professional designers to create a unique plan that brings all of your wants, needs and inspirations together. Based upon an approved design, we will be able to provide adjusted pricing if needed. Castlemont Homes presents you with a formal contract and specifications in order to finalize the plans into a working set of construction drawings. We will walk your lot with you and work with the surveyors to make sure we choose the best possible location on your lot. Documents are signed and we are ready to move forward once you obtain financing. Typically, custom homes are constructed using “construction to permanent loans.” We can assist you with all the documents needed to finalize the loan process. It is important to select a financial institution that specializes in these loans, since loan packaging and servicing during construction loans are more complicated than the standard 30-year mortgage. The option of having Castlemont Homes take care of the construction loan and have the homeowner purchase the home at completion is available as well. Within the next few weeks, you should be able to close on your interim construction loan, and we’ll begin the processing and approvals of building permits. During the selection of materials, colors and finishes, you have the opportunity to work with a professional interior designer. This phase basically includes choosing every element that transforms your house into a home. We invite you to utilize their expertise to narrow down the choices so that you can feel confident and not overwhelmed when making decisions. Once the design process is complete and we are close to starting your home, you can expect frequent construction updates. A pre-construction meeting is held to review all communications and documents to ensure a smooth building process. While each home that we build presents unique opportunities and challenges, our goal is to help you understand the progression of the building process from start to finish. The foundation is a critical element of the building process, and it must be done correctly to prevent problems further down the road. Your lot needs to be cleared and adjusted (i.e. fill dirt brought in, leveling, etc.) to address drainage needs to prepare the space for your new home. Next, form boards will be put up which serve as a mold for the foundation. After plumbing lines are put in place, the foundation is poured and you’ll be able to see your home’s footprint. After the foundation has been poured and has set up, the form boards are removed and framing of the house begins. The frame of your home is the underlying structure of the dwelling. As the framing progresses, you will see the layout of your home unfold, and you’ll be able to identify different rooms, doorways, and windows. After the first inspections, we will invite you to walk through your home. 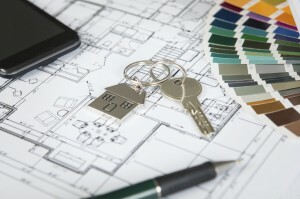 At this point you will be able to visualize more easily what your dream home will look like. This is also the time that we talk about the placement of light switches, electrical outlets, etc. Walls and trusses will be framed, and the roof sheathing will be installed. Another framing inspection will also take place. This is when all mechanical components and wiring are installed. It is incredibly important that everything be installed correctly, since it will soon be covered by sheetrock and will be much less accessible. This is also the time to install a home fire sprinkler system or home entertainment system. During this stage, plumbing and mechanical components will be roughed in. Venting, ductwork, a water heater, and the HVAC system will be installed. Any exterior finishes, such as masonry and wood, will be installed at this point, as well. Inspections are a very important part of the home construction process, for they ensure that every element of the building is done correctly. After the foundation is poured and the framing is completed, an inspector will visit the site to view the progress. They will check the framing and the mechanical components of the home, making sure they are up to code and installed properly. Insulation is a critical factor in determining your home’s energy and cost efficiency. When installed adequately and properly in your home’s floors, walls and ceilings, this relatively inexpensive product can save you large amounts of money throughout the life of your home, simply by preventing heat (and cool air) from escaping your home. Once your home is framed and wrapped, and all the mechanicals have been installed, the sheetrock is put in place to form the walls. We will assist you in deciding the thickness of sheetrock you want to use, and if you want to use screws or nails to fasten it to the studs and joists. You may also want to consider what type of texture and paint to use on your walls to achieve your desired effect. Once all of the major structural components have been installed, it is time to move to the more decorative details of the home. This includes cabinets and countertops, interior doors, flooring, fireplaces, moldings, staircase balusters and railings, and base and door trim. As you approach the final stages of the home-building process, you will probably experience excitement, anticipation and maybe even a little anxiety. All of these emotions are understandable, because by now, you are seeing all of the hard work that has gone into the process take shape, and the final product, your dream home, is finally within reach. It is at this point that your home develops its personality through your choices of lighting fixtures, bathroom accessories and fixtures, window treatments and more. 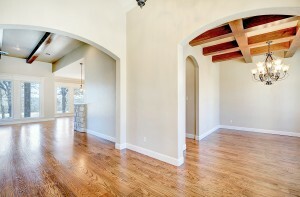 Once we have completed a final walk-through of your new home, you are ready to move in. While we discuss warranties up front, this is also when we review construction finishes and details, along with all the appliances and equipment systems. Homeowner satisfaction is the lifeline to future work for Castlemont Homes, with referrals of new customers accounting for over 50% of our new business. We want you to be confident when you choose Castlemont Homes that we will be with you long after you move in.